People love to complain—we all want to rant when we’ve been wronged, justified or not. So often we forget to pause and applaud good work. I recently joined a service oriented industry and know how nice it is to receive a kind letter of praise for a job well done. 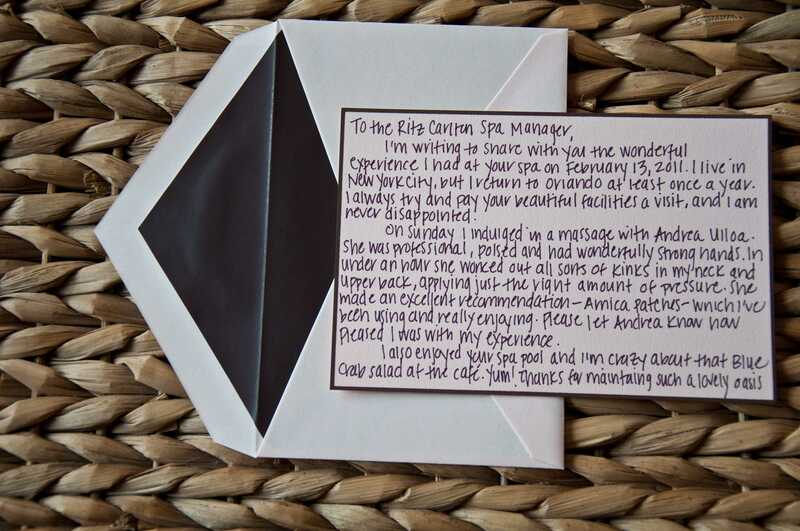 I am writing to share with you the wonderful experience I had at your spa on February 13, 2011. I live in New York City, but return to Orlando at least once a year. I always try and pay your beautiful facilities a visit, and I am never disappointed. On Sunday I indulged in a massage with Andrea Ulloa. She was professional, poised and had wonderfully strong hands. In under an hour she worked out all sorts of kinks in my neck and upper back, applying just the right amount of pressure. She made an excellent recommendation at the end of my visit, Arnica patches, which I’ve been using, and really enjoying. Please let Andrea know how pleased I was with my experience. I also enjoyed your spa pool and I am crazy about that Blue Crab salad at the Café. Yum! Thanks for maintaining such a lovely oasis with such wonderful service. I look forward to my next visit.